With over 15 years experience in the animation industry, Will Rose is a filmmaker whose work we always keep an eye out for here on Directors Notes. His award-winning short film The Goat Herder and his Lots and Lots and Lots of Goats is a film that sticks in your mind due to its playful style and tone and it’s hard not to be impressed by his involvement in some of the most popular children’s animation to hit the small screen over the last couple of years (including Peppa Pig and Hey Duggee). With his latest short Eagle Blue inspired by the music of Julia Holter, we asked the director to take some time out of his busy schedule and give us an insight into his production process. 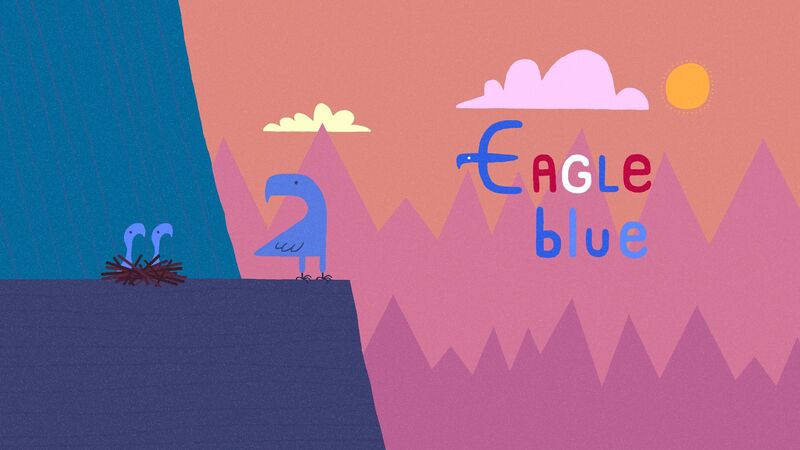 Eagle Blue follows the story of a mother eagle looking to feed her young…What can you tell us about the inspiration behind this story? Most of my ideas are inspired by nature. From an early age I was always interested in birds and animals. I was as fascinated with Robins and Woodpeckers as I was Ewoks and Storm Troopers. A few years ago I drew an eagle character and started to do a few animation tests. I had no idea what to do with it until I heard a piece of music by Julia Holter from her album Loud City Song. It was a real trigger to unlocking the idea behind Eagle Blue. I then knew I wanted the music to tell the story with no need for SFX or dialogue. From that point on I would listen to the track on any available train journey and frantically type ideas in to my phone inspired from the different sounds and instruments in the track. In the end I had this great long list of ideas that didn’t make a lot of sense and needed a LOT of editing. Last summer I took a trip to Eastport in Maine in the U.S. It is the land of bald eagles, bears and moose. I had a fantastic time exploring the forests and the trip certainly had an influence on the direction the film took. I took pictures of the eagles in flight and made some sketches in coloured crayons. I think the experience made me realise I wanted to make something set outdoors away from phones, and the Internet. A real escape from technology. I enjoy making films that make you want to connect with nature. I enjoy making films that make you want to connect with nature. My starting point was an eagle that lived on a tall mountain and needed to feed her hungry chicks. I also knew I wanted her to interact with the town below. I wanted the eagle to attempt to catch food naturally, but then be lured into the town with the temptation of an easy meal. I like the idea of animals taking back control. I also liked the slight environmental message in that the town was taking the eagle’s natural food source away forcing her to visit the town. I never wanted those ideas to be too overbearing. They were to be in the background, the humour and design of the film were must important to me. In the credits of the film you acknowledge the Julia Holter track as inspiring the film, how much did her track affect the style of Eagle Blue? I became aware of Julia Holter after connecting with Domino Records on my goat herder short (The Goat Herder and his Lots and Lots and Lots of Goats). I had asked permission to use a piece of music by the San Francisco based band, Vetiver, and they very kindly let me use it. I then started checking out a lot of the Domino artists and in particular Julia Holter. Her latest album, at the time, was Loud City Song. It’s a beautiful record and I began to search out all of her back catalogue. Via Domino I stumbled across an instrumental version of the album and that is when I fell in love with the song This is a True Heart. I loved the mood of the track. To me it evoked a sixties French Rivera / relaxed European kind of vibe. Not only that, but like a lot of Julia’s music, it contained interesting abstract sounds that were interwoven in the melody. There are footsteps, atmospheric abstract noises and most importantly to me, what I thought sounded like an eagle’s screech. I’d always wanted to do a sound synch based project and this seemed to be the perfect moment to combine my passion for wildlife and love of music. The section of the track that got me hooked, and really set the tone for the film, was the saxophone solo. It is preceded by the sound of human footsteps, but I instantly could see the eagle skulking into the café, pinching some food and bursting into the air when the solo kicked in. I knew that was the defining moment the rest of the film would be built around. There were a lot of strange atmospheric sounds at the beginning of the track too that would form the introduction to the eagle and the chicks. The ascending vocals lead us up from the town to the top of the cliff and the young chicks screech out to the strange sounding horns. Once I had decided I definitely would love to use the track I contacted Julia’s management and put forward my idea. I sent some links to my previous film and my short about singer/song writer Thao Nyguen for the California Inspires Me series for The California Sunday Magazine. They let me know that she was happy for me to use it, but would have to ok the final film. I decided I wouldn’t show her the film until it was complete. It was quite a risky game not knowing if my film would be approved. I didn’t really have a plan B! Luckily she liked the final film and now I‘m just dying to get it out there and in to festivals. It’s pretty crazy, as Julia’s latest album Have you in my Wilderness has really taken off; it’s getting amazing reviews and is constantly played on the radio. I was a little apprehensive at her recent success. I thought: “Damn, why is she getting so popular, she’ll never let me use her track? !” I’m so grateful it all worked out. Colour plays a large role in giving the film its somewhat sunny disposition, how much thought went into the colour palette when designing the film? The first time I drew the eagle she was blue. I have no idea why, but I do enjoy choosing a colourful palette. I was using coloured pencil crayons on coloured paper so I guess it was always going to be colourful. Once I had decided she was blue I think the rest just fell in to place. I certainly use a similar range of colours in all my work. I think it’s important to have a theme that people can recognise in your work. That would also apply to my design style. I like to keep it consistent. Simple, but effective. I’d like to think that the characters in my previous film could easily pop up in my latest. In fact the goats almost did. I thought about putting them in the background, but decided it might be too distracting. With only three minutes to play with I wanted to the viewer to stay focused on the eagle. I find choosing a colour palette very enjoyable. A bit like writers might bounce ideas off their colleagues and peers, the colour choice comes from choosing the first one and then seeing how the others bounce off it. The music definitely evoked a European theme to me in regard to landscape and characters, but after my trip to America, I ended up using a lot of buildings from the U.S. The people look European with berets but the buildings are based upon Eastport in Maine. One of the buildings is actually a restaurant called the Happy Crab, which does a great lobster roll! I like to think it gives it a fictional ‘it’s somewhere, but not particularly anywhere’ feel to it. I like to make shorts with a universal appeal that you could show your little niece, but are still cool enough to show your pals. I love to use bright colours, simple design and humour to keep the audience entertained. I hope I’ve achieved that with this new short. It makes me laugh to think that as a boy I would point out when a bird did not have the right markings or correct song in films and now I’ve made a short film with a blue eagle in it who is completely fictitious and bears no resemblance to any species! Although the designs are quirky and not scientifically precise I wanted to use wildlife references from natural world. An example would be when the crows ruin the eagle’s chances of catching the rabbit. It’s called ‘mobbing’ when a crow will deliberately harass a bird of prey in order to get them out of the area. Also the point in the film when the eagles pass food to each other is also a reference to birds of prey in real life. The male will often pass a kill to the female in an act of courtship. It was fun to add these little touches as well as adding the more ridiculous moments that happen later on to balance the facts with some humour. What can you tell us about the production? How long did it take, and what tools did you use? I took three months off to make the film. I knew I had some work coming up on Hey Duggee (a series by previous DN interviewee Grant Orchard) so it was the perfect scenario for me to be at ease and not worry about the next job. It’s difficult to take time off and turn down jobs while you’re making your own project. Eyes definitely roll when you tell people you’re ‘taking time off to make my new short film!’ I think it’s because so many projects, especially in animation never get finished. I knew I had to make something relatively simple that I could achieve by myself. Maybe I will collaborate for my next short. I enjoy working in Flash. I find it very immediate. I then popped it in to After Effects to add texture or for the odd camera move. I’m not a technical kind of guy so I always try and keep it as simple as possible. Flash allows you to draw directly in to the computer, which I always think freshens the animation up. I see a lot of After Effects motion graphics that all look the same. With this project I did a lot of drawing and kept the animation on 2’s to give it a slightly more traditional look. I always start with paper. Most of my work starts with one scribbled sketch on a post it or whatever comes to hand. My previous goat herder short came from something my little niece told me about a goat herder on holiday in Spain. I drew a quick sketch of the goat climbing on an impossibly steep mountainside and from that moment I knew what would follow. Eagle Blue was no different. Once I knew what she looked like the rest followed fairly swiftly. I did spend most of the year before I took the time off, writing down ideas as I listened to the track. Once I was free I began editing down all these ideas into a storyboard and then animatic. It’s tricky being bound by a piece of music. You can’t lengthen or shorten scenes. You are completely at the mercy of the music. On the other hand you have a tight timeline and song that tells the story without worry for creating dialogue or spot effects. I found it extremely challenging, enjoyable and rewarding. This summer I’m heading back to Eastport in Maine to be an artist in residence for a month at the Tides Institute and Museum of Art. Eastport is a beautiful quiet little fishing town that sits on the Coast of Moose Island. I’ve already mentioned the bald eagles, but in the summer I’m hoping to see the whales that come into the bay. The aim is to create a piece of art inspired by my time over there. I’m really looking forward to it. I’m sure it’ll be the wildlife that’ll inspire me to create my work. Also the amazing lobster rolls and local beers, I’m sure, will aid me in my quest! When I return it’ll be back to animating on Hey Duggee at Studio AKA. It’s an absolutely fantastic show. I think it’s seriously one of the funniest shows on TV. I worked on the first series and am now on to series two. It’s an absolute pleasure working on something you really believe is brilliant. I’ve learnt a lot from working on the show and it certainly keeps me ticking until I make the next short. This was such an enjoyable and informative interview to read. I love Eagle Blue and the music is fantastic. I\’m also a fan of Hey Duggee and Peppa Pig so it was very exciting to read about Will Rose\’s process, learn he used flash and AE, and to see his sketches. Thank you!